← Would you pay $25,000 to attend a Super Bowl party? Covering the High-profile Art Auctions — art or science? Hello all, last week I was able to cover the very high-end art auctions at Sotheby’s and Christie’s on a press assignment for Aljazeera. Pretty heady stuff. There was great buzz in the room, especially on Tuesday night, when the German artists Gerhard Richter broke the record for most expensive living European artists sold at auction ($47 million). Prized works by new and old sell for record sums at recent Christie’s and Sotheby’s auctions in the UK. London, United Kingdom – It took a breathtaking span of 26 hours in London for more records to fall in the thriving global art market. 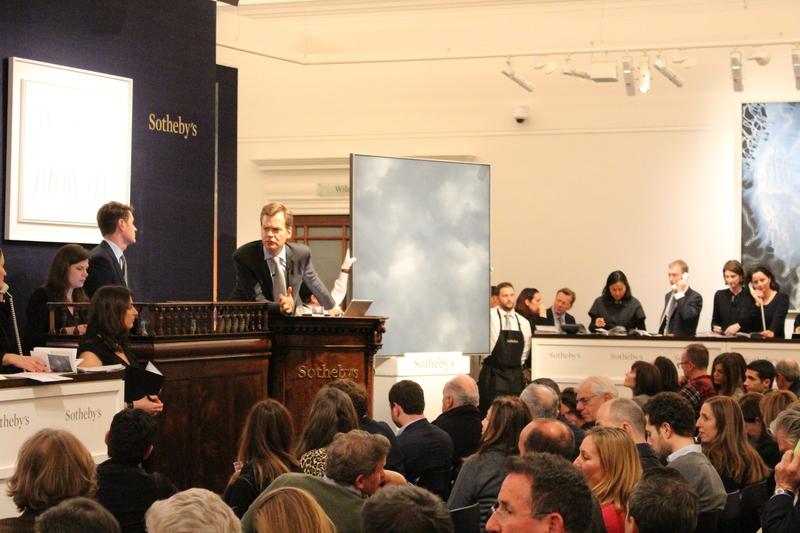 The highest priced lot took place on Tuesday when Richter’s Abstraktes Bildsurprised the packed auction room on Bond Street with aggressive phone bids coming in at 2 million British pound increments ($3.1m). The anonymous bidder, reported to be an American, was represented by Sotheby’s worldwide co-head of contemporary art, Cheyenne Westphal. I think I can genuinely say it went to someone who truly wanted this painting, and he was set on buying it tonight,” Westphal said, noting Richter also happened to be her favourite artist. “Richter is not hot all of a sudden, he has always been sought after,” said Arianne Levene Piper, founder of the New Art World consultancy. I don’t know what to make of these Clouds by Richter either. Nevertheless… £5 million, anyone?